bushman74 wrote: I finally saw the book. This guide is a MUST to any newbie or experienced collector of canadians coins. This is a 8 1/2 x 11" spiral bound book printed on thick glossy paper. It is built like a larger Charlton guide and this guide is meant to be used. The introductory chapter is very helpful to understand the grading system used in Canada. 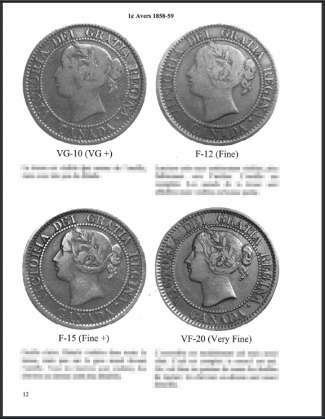 Each grade of obverse and reverse is displayed using a high resolution photograph enlarged to about 3 1/4 inches (83 mm) diameter for each grade. Each page has four grades with a description as you can see in this sample of page 12 of the French guide (1 cent, Obverse, 1858-1859). If someone wants to send me a scan of the Table of Contents of the English guide, I will make a Quick Reference for you. Q: Are you aware that Ryan Elliot took customer submitted books off site, left them in his truck unattended, and then brought them into a local comic shop and graded them there?